Gift Cards can be purchased from reception or online* and are the ideal gift for the climber in your life! The recipient can use it for entry to the wall, membership passes, courses and coaching or anything in our extensive climbing shop. They can even be used in our cafe. No matter how much you gift on our Gift Card, there’s always something a climber can use it for! *If buying online you can choose to have the Gift Voucher emailed directly to the recipient or to yourself to print out. 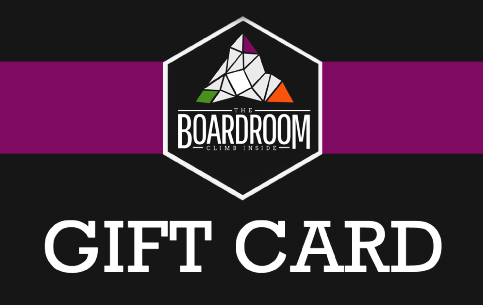 The Boardroom Gift Card may only be used at The boardroom Climbing Ltd as part or full payment for products or services. Gift Cards may be redeemed in house or by phone. If the Gift Card is lost or stolen we can cancel it to stop anyone spending your balance and issue a new card. However we cannot refund any balance spent on a stolen card. Gift Cards may not be redeemed for cash.